I made this the night after the roast chicken, having been inspired by an episode of Nigella Bites which screened on Lifestyle Food whilst I was busy writing my Musicals essay (which is done now... hence my spending loads of time blogging!). Her recipe must be from How To Eat - the only Nigella book I don't own (hint hint). Basically what I can remember her doing is roasting a chicken, then putting the pan juices in a small saucepan with water-soaked raisins and toasted pine nuts, adding some fresh thyme and heating it through. Then she pulled the meat & skin off the chicken, and mixed the meat, sauce and some cooked tagliatelle in a big bowl. Anyways - the lemon & garlic spatchcock chicken I made had lots of juices left over (and some meat left on random parts of the carcass), so the next night, I scooped all the solidified juices (sorry to be gross!) into a saucepan with marsala-soaked raisins and pine nuts. 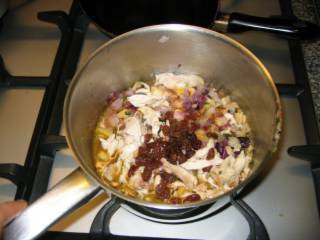 Also, there were bits of lemon skin and red onion left in the chicken pan, so I chopped them up and added them to the sauce. Then I pulled all the meat off the carcass and mixed it up with some fettucine and the sauce. 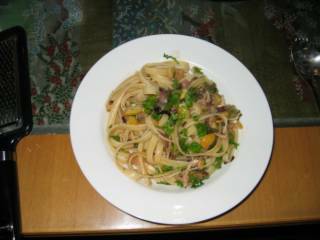 It was really nice, with parsley and parmesan cheese. Word of advice - my mum didn't like the lemon skin in the pasta and picked it out. I liked it though - so it's your call whether you add it or not. It does look pretty against the purple onion bits though!